Comment Finding the path by the Golf Club House is a little tricky but thereafter no major problems. Mostly undulating, quiet countryside with a few stiff climbs and stiles. With the New Inn on the right, walk forward along the main road to soon reach a left bend by a golf club entrance. Go straight ahead off the road over grass to cross a stile and footbridge in the corner ahead. Join the entrance road to the golf club passing a lodge on the left. Just ahead is a car park. Swing left in front of the car park towards a gate into a cricket pitch. Do not go through but turn right by the gate to go along between fences soon emerging onto the golfing area. Keep along towards the club house. Just short of the building bear left over grass to a path going slightly uphill along a line of trees. Head just to the left of a large Victorian house in the distance. At the top of the rise the path emerges onto a road. Cross with care to a stile the other side on the Elham Valley Way. Skirt the house on the right to a stile at the top of the small field. Cross into a large pasture on the right. Keep along the top edge of this field with a fence on the left towards a distant house. Emerge over a stile by a fieldgate onto a road. Go down to a T-junction with a main road. Turn left along the road passing the old village pump in a recreation ground on the right. Soon pass the Coach & Horses pub on the right and keep on along the road looking for an asphalt footpath going off right opposite a church. Follow this footpath downhill past a school to reach a road. Cross with great care to a lane opposite sign posted ‘North Lyminge’. Walk along this lane. Just before the far end meet a Y-fork with several footpath signs. Turn right here on a bridleway towards Shuttlesfield. Follow the track uphill past a house called ‘Beechings End’ on the line of the old railway. Where the track swings left to an isolated house, keep forward through a fieldgate and on uphill with a hedge on the right. At the top of the rise go through a gate onto MOD land and keep ahead towards a deep wooded cleft in the hill ahead. The path descends to a gate by warning signs and then continues steeply uphill. At the top of the incline pass through a wooden fieldgate. Bear right along the edge of the buildings of Great Shuttleworth Farm through two double fieldgates towards a pylon. Pass to the right of the pylon and keep ahead on a sunken green way, gradually uphill to a double fieldgate. Pass through and continue, bearing slightly right, to the brow of the hill. Keep going to reach two swing gates set in a fence. Drop down, slightly left, to a house at the bottom corner of the field. This is Tan Barn. Turn left on the road and follow it for some way, past Little Shuttlesfield Farm, to a bridleway on the right going down past Acrise Court and onto MOD property again. Keep ahead through gates and on by the hedge on the right for some way to reach wooden fieldgates by a sheep fold. Just beyond the hedge turns right. Walk ahead, uphill, towards the highest telegraph pole and distant aerial mast. Keep about 100m away from the fence over on the right. At the top of the hill pass to the right of the highest pole and soon begin to descend. Bear right to the far righthand bottom corner of the field and several fieldgates. Go through to gain an enclosed uphill gravel path. Follow this long incline and eventually reach a road at Paddlesworth. Turn left here and go downhill, passing the painted house on the left, and keep on along the road for some way, ignoring a stile on the right, until approaching a wood on the right ahead. Immediately before the wood turn right onto a farm track. This follows along with the wood on the left and soon reaches a wooden fieldgate leading into a gravel car park. Go through gate and turn immediately left to cross a stile into an upwardly sloping pasture. Go uphill with a fence on the right for some distance to the top righthand corner of the field. At the top cross a fence (no cross piece on the stile) into a wood and keep ahead ignoring cross tracks. The wood soon thins and the path emerges by fields to go over a double stile into an enclosed path. This soon emerges onto a road. Cross to another enclosed section which again soon reaches a road. Go a few paces left to cross the road to a stile into a field. Walk across the field passing a pond on the right near the far side, and keep on into another field. Go forward with a hedge on the left towards a distant house. Eventually a stile meets a road. The next path is a little difficult to find. Opposite the stile just crossed is a new bungalow. Turn left for a few paces and pass the front of the bungalow. Now turn right down the side of the bungalow to a stile into a horse paddock. Cross this to a wooden fieldgate and go on down to the bottom lefthand corner of the next paddock. Cross the stile hidden in the hedge (or turn left to go down to a road and turn right) and keep on downhill to a gate and broken stile in the bottom lefthand corner. Go forward to a main road. Carefully cross the main road and turn right. Immediately cross a service road and in a short distance, go left over a stile into a steeply sloping field. Turn diagonally right uphill towards a wood with a new roundabout down on the right. At the corner of the wood, go through a rusty fieldgate and keep forward with the wood on the right. At the far corner cross a stile into a bamboo plantation. Keep forward to a road. Turn left a few paces then right up a path through woods. Soon reach another road by a new housing estate. Turn right to follow the road all the way back into Hawkinge. 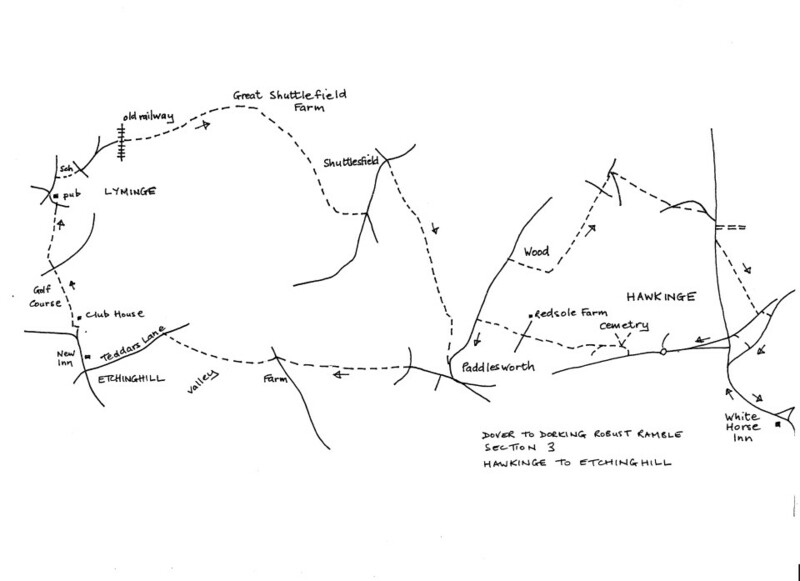 On reaching the main road, turn left and follow it along to the White Horse Inn and the start of the section.